We take your accommodation very seriously at the Majestic Hotel. Luxury impeccable style and comfort is everywhere. Soft beds, spacious marble bathrooms with Jacuzzi bathtubs, verandas offering astounding view, soundproof rooms and other numerous facilities guarantee a thrilling experience. All rooms enjoy sea view, either towards the west (volcano sunset caldera view) or to the east (Aegean Sea - sunrise view). Standard room facilities include: A private veranda, Jacuzzi bathtub, finest beds & linen, soundproofing, bathrobes, slippers & beach towels, autonomous control A/C & ceiling fan, pre-stocked mini bar, tea & coffee facilities, direct dial phone, SAT TV with flat screen, Home Cinema / DVD Player, Electronic Safe, free Wireless Internet access and a Stereo System with CD collection. The Master Suite additionally has: private balconies, an indoor area of 60 sq. metres, lounge, bedroom with electrically powered adjustable orthopedic bed, extended bathroom facilities, bathtub with whirlpool system, shower cabin, environmentally friendly autonomous control A/C, high fidelity sound system, personal laptop computer device, espresso coffee facilities, guidebooks of Santorini and Greece, pillow menu & dressing room. This room type views the eastern part of the island of Santorini. You can gaze at vineyards, picturesque villages and the Aegean archipelago in absolute serenity. Whilst sitting on your veranda, you witness Santorini's amazing landscape of steep volcanic cliffs and a breathtaking caldera in which the volcanoes stand. The sight is the most characteristic of the island, especially at sunset time. The Majestic’s Family Room is on two levels and it can sleep up to four people. A staircase leads to the upper level and the master bedroom. On the lower level you will find the living area with sofa beds and a luxurious bathroom. 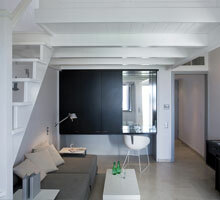 The Master Suite is an exceptional type of accommodation quite unique to Santorini. It is situated in a privileged position in the hotel and overlooks the Volcano and the sunset. Superior aesthetics, space, unlimited light, top designer furniture from Bauhaus to contemporary, high quality materials together with automated facilities ensure an extraordinary stay.